Grandview, MO – (Feb. 5, 2019) – The new EME5625MD louver from Ruskin®, a 5-inch vertical stationary louver, is engineered to provide added protection to buildings during hurricane conditions. In compliance with Miami-Dade standards, the EME5625MD is constructed of extruded aluminum, is low maintenance and offers high resistance to corrosion. The EME5625MD is designed to meet a wind load of 160 psf. Its 1.25-inch vertical blade spacing prevents penetration of wind-driven rain, earning a Class A efficiency rating at 50 mph. The louver meets the AMCA 550 standard, which is tested up to wind speeds of 110 mph and a rain fall rate of 8.8-inches per hour. It also meets the AMCA 540 Enhanced Protection standard for “Missile Level E” impact (nine-pound 2x4 at 55 mph), which is required for critical/essential facilities and safe rooms, such as hospitals, police stations and community centers. Testing at these levels demonstrates the advanced protection this louver can deliver under extreme weather conditions, as it is AMCA-certified for both wind-driven rain protection and air performance. This model is also available in round and triangular configurations. As part of its commitment to quality, Ruskin covers all its products, including the new EME5625MD, with a limited five-year warranty from the date of delivery. To learn more about the EME5625MD, visit www.ruskin.com/catalog/model/EME5625MD. For more information about Ruskin, visit www.ruskin.com. Ruskin is a worldwide leader in manufacturing air control solutions. Backed by nearly 60 years of expert engineering and innovation, Ruskin is widely recognized as the most specified brand for high-performance air control solutions, including dampers, louvers, energy recovery ventilators (ERV), air measurement devices and sound control for HVAC systems. Ruskin products are used in commercial applications such as data centers, high-rise buildings, retail, hotels, healthcare and education facilities. In addition, Ruskin products can be found throughout the world’s industrial applications, such as warehouses and transportation hubs. Ruskin is owned by Johnson Controls, Building Technologies & Solutions, which includes air systems, batteries, building automation and controls, fire detection, fire suppression, HVAC equipment, industrial refrigeration, retail solutions and security. For more information about Ruskin, visit www.ruskin.com, or find the company on Facebook, Twitter, LinkedIn and YouTube. Johnson Controls is a global diversified technology and multi-industrial leader serving a wide range of customers in more than 150 countries. Our 120,000 employees create intelligent buildings, efficient energy solutions, integrated infrastructure and next generation transportation systems that work seamlessly together to deliver on the promise of smart cities and communities. Our commitment to sustainability dates back to our roots in 1885, with the invention of the first electric room thermostat. We are committed to helping our customers win and creating greater value for all of our stakeholders through strategic focus on our buildings and energy growth platforms. For additional information, please visit www.johnsoncontrols.com or follow us @johnsoncontrols on Twitter. Johnson Controls Building Technologies & Solutions is making the world safer, smarter and more sustainable – one building at a time. Our technology portfolio integrates every aspect of a building – whether security systems, energy management, fire protection or HVACR – to ensure that we exceed customer expectations at all times. We operate in more than 150 countries through our unmatched network of branches and distribution channels, helping building owners, operators, engineers and contractors enhance the full lifecycle of any facility. Our arsenal of brands includes some of the most trusted names in the industry, such as Tyco®, YORK®, Metasys®, Ruskin®, Titus®, Frick®, PENN®, Sabroe®, Simplex® and Grinnell®. For more information, visit www.johnsoncontrols.com or follow @Johnsoncontrols on Twitter. XP500WD Louvers are rated to FEMA standards. 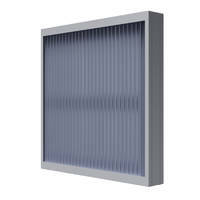 Stationary Acoustic Louver is Miami-Dade qualified. Aluminum Louver protects against penetration of wind-driven rain.